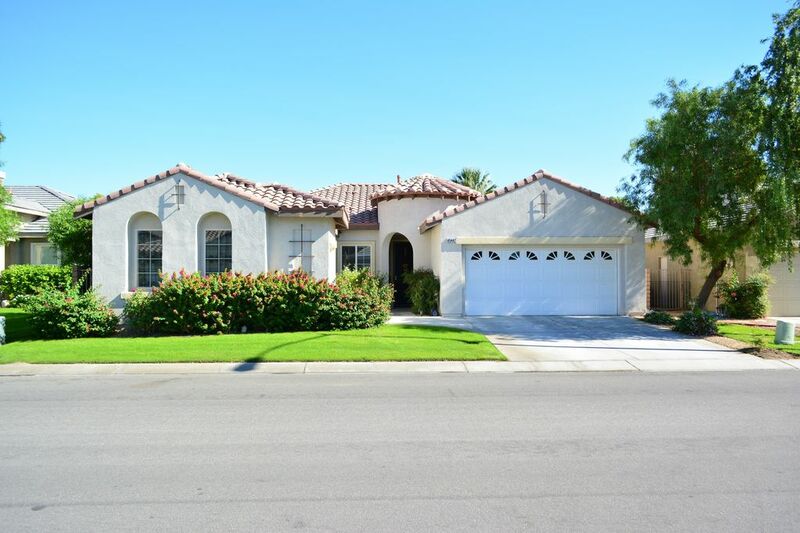 Take advantage of this lovely 2350 square foot home located on the 14th Fairway of the Indian Palms Country Club 27-hole USGA championship golf course. Community pool, state-of-the-art lifestyle fitness center, clubhouse, restaurant and pro shop. Conveniently located near La Quinta shopping, Empire Polo grounds, and recreational activities in a lovely climate. This turnkey home is ready for you and your loved ones to enjoy in this well managed gated community. All the amenities of home await your arrival; fully equipped kitchen with elegant granite counter tops and tile floor, breakfast area, family room, large dining area for entertaining with a spacious living room for your enjoyment. The master bedroom suite includes spa bathtub, full shower and two walk-in closets. Guest rooms are fully furnished complete with private cable television. This functional getaway includes office and work station with DSL for your computer. Other amenities include washer and dryer, double car garage. Sit back and relax on the patio with gas grill and enjoy the beautiful view. We bought this home because of its beauty and open, spacious style. The rooms are good size and the master bedroom is a small oasis complete with a jet-bath to ease the tension away after those hard, stressful days. We love being located on the fairway. It's quiet, peaceful, and thanks to added trees in our landscaping, it's safe from errant tee-shots. :) We love grilling on the back porch or taking a dip in the community pool or working out in the health club facility. It's a great place to be and we would be honored to share it with you. This location is wonderfully placed for many of the major events and festivals that happen in the Coachella Valley. From Coachella Fest to the Annual Music & Arts Fest to Stagecoach (Country Music Fest) to major golf tournaments and professional tennis tournaments alike, it's all within reach. And then there's the peacefulness of this home and location. Located on the fairway, it's typically very quiet in the mornings as you are sleeping in or taking in the morning air on the back porch. This is my 5th time staying and I couldn’t be more pleased with the experience. Great homeowners who went out of their way to ensure my group had a pleasant stay. We stayed at this property during a lacrosse tournament being held at the Empire Polo Club. The house is well appointed, spacious, and very well kept. Sitting out on the porch watching the sunrise was very relaxing. We took advantage of both pools in the neighborhood which was a lovely perk. Very quiet. We would definitely rent this house again. Lovely owners. Communication was exceptional. So glad to hear that you enjoyed the home and that it met your expectations. We were honored to have you stay with us. And thank you for the kind words and wonderful review! We loved staying here for a festival weekend. Being walking distance from the polo grounds was amazing compared to people waiting up to 3 hours for Uber/shuttles and paying $30 surcharges for a taxi! Plenty of friendly neighbors inside the community willing to drive us from the gate to the house for free or $10 donation in golf carts, which was great because it's a bit of a walk especially in the heat. The house was lovely, clean, and much bigger than expected - 2 entire dining tables/areas and two separate living room/sofa areas. AC was nice and cold in the house! The pool was great also. Hosts were helpful and responsive to text/email. So glad you had such a great time, Christine! Thank you for the awesome review and for being such a great guest! I have stayed here multiple times and have loved it each time. Super comfortable with plenty of amenities, nestled in a really nice community. The house was very comfortable and spacious. Nice to have a garage. And the landlady had left staples for us to use--particularly in the kitchen. Another wonderful stay at this very charming property. This is my second time staying at this home and I highly recommend it. It's super comfortable with great neighborhood amenities and even better hosts! Within walking distance from Coachella Festival and Stagecoach Festival. Special Events are subject to higher rates than shown. Rates are subject to change until reservation is confirmed.